Microsoft Windows is a family of operating systems developed by Microsoft since 1983. The latest version of 2018-10 is Windows 10 October 2018 Update. The first versions of Windows were an operating environment and graphical shell for MS-DOS. Windows 95 and later used MS-DOS for booting and kernel initialization. NT-based versions of Windows use a redesigned kernel and do not rely on MS-DOS. Microsoft Windows debuted to the world on the Fall COMDEX 1983 computer expo as an operating environment running on top MS-DOS. The final version of the product with the version number of 1.01 was later released on 1985-11-20 and did not gain much popularity. Windows 1.0 was a cooperative multitasking desktop environment with a tiling window manager. The first versions of Windows used the MS-DOS Executive, which was a simple file manager, as a shell, which is generally the first application ran on startup providing the user experience. Other applications included in the first version of Windows included Calculator, Cardfile, Clipboard Viewer, Clock, Control Panel, Notepad, Paint, Reversi, Spooler, Terminal, and Microsoft Write. Three minor updates were released in the two following years adding support for more hardware. A major update called Windows 2.0 was released in 1987 adding features such as overlapping windows. This version also introduced support for the Video Graphics Array and PS/2 mouse. A separate edition called Windows/386 was introduced that took advantage of the virtual 8086 mode of the then-new 386 processor to multitask MS-DOS applications under Windows; this would later become known as the 386 Enhanced Mode and become the cornerstone of Windows 9x. In later revisions of the Windows 2.0 environment, the original edition was renamed Windows/286. Windows 3.0 was released in 1990 and it became the first widely successful version of Windows. The new features included an revamped user experience consisting of the Program Manager, which allowed easy management of installed applications. A new File Manager was also included to replace the former shell, which was now deprecated. Under the hood, the new Standard Mode was introduced, which took advantage of the protected mode of the 286 and 386 processors. The previously separate 286 and 386 editions of Windows were unified into one version. This version of Windows was able to operate in three modes: Real mode intended for computers with the original 8088/8086 processor, Standard mode using the protected mode feature of the 286 processor, and 386 Enhanced mode combining the improved protected mode of the 386 with its ability to create and manage virtual 8086 machines for MS-DOS applications. A major update dubbed Windows 3.1 followed in 1992 with the brand new red-green-blue-yellow Windows logo resembling a flag. The user interface was refreshed in this release, including new colorful icons. This version of Windows removed the real mode of operation and the MS-DOS Executive application. It was accompanied with a variant called Windows for Workgroups (WfW) 3.1 with an integrated networking capability, which later received a larger update bringing its version number up to 3.11, introducing 32-bit disk access and also removing the Standard mode of operation. The regular variant of Windows also received the 3.11 update, which was essentially the kernel of Windows for Workgroups 3.11 backported to Windows 3.1. A 32-bit TCP/IP stack was ported from an early version of Windows 95 and released in 1994 as a downloadable plugin for Windows for Workgroups 3.11, providing early testing for the 16/32-bit compatibility features of the next version of Windows. On 1995-08-24 Microsoft released Windows 95 also known under its codename "Chicago" with a brand new user interface with a Start menu, taskbar, and the desktop, as provided by the new Windows Explorer. Its hybrid 16/32-bit architecture made it possible to make and run 32-bit Windows applications and drivers while keeping a great degree of compatibility with already existing 16-bit ones. Among other improvements in this version was the support for long filenames through an extension to the FAT16 file system. Windows 95 was the first release of Windows to be packed together with a specific MS-DOS version, however, the old operating system was used only as a bootloader and a compatibility layer for ancient device drivers. Most MS-DOS user applications were either extended with Windows code or entirely replaced with a Windows version, keeping only the ones that were required to run without Windows, e.g. during the OS installation, such as FDISK and FORMAT. During its lifetime Windows 95 saw several larger updates dubbed the OEM Service Releases (OSR) that were released only to computer manufacturers, specifically OSR 1.0, OSR 2.0, OSR 2.1, and OSR 2.5. A Service Pack was also released that updated an RTM copy of Windows 95 to the OSR 1.0 level. In 1997 a USB Supplement was released for OSR 2.x that added support for the then-new Universal Serial Bus interface. The classic Windows line received a major update on 1998-06-25 with the release of Windows 98 codenamed "Memphis". It was the first version to integrate Internet Explorer deeply into the operating system's user interface as a part of the Windows Desktop Update. Many parts of the UI started using HTML and Internet Explorer's rendering engine to present a web-like user interface. A feature called Active Desktop made it even possible to set a webpage as the desktop background. Under the hood Windows 98 introduced the new Windows Driver Model, which enabled the use of the same drivers on Windows 9x as well as on the radically different Windows NT based operating systems. A year later, Windows 98 received an update which was called the Second Edition, which included a new version of Internet Explorer, added Internet Connection Sharing and improved USB support. In 2000, Windows ME (Millennium Edition), the last release of the classic Windows line was released. It carried over the improvements made to the user interface in its NT-based counterpart, Windows 2000. Windows Me is based on Windows 98, however, access to the real mode MS-DOS was restricted in order to decrease boot time among other changes to the kernel. It was infamously known for its stability problems partially caused by the rushing of its release following the cancellation of the Neptune project. It was replaced by Windows XP in 2001, ending the era of classic Windows. Windows NT (New Technology) is the current iteration of Windows. It is built on the NT hybrid kernel, which was originally intended for use in OS/2 3.0 but was adapted for a 32-bit version of Windows after the Microsoft - IBM split. The first release based on the new kernel was Windows NT 3.1, which was launched in 1993 and was equivalent to Windows 3.1 released two years earlier. All NT-based releases up until Windows 2000 were intended primarily for business use. With Windows XP, the NT series replaced the classic Windows series, creating a single operating system for consumers and businesses. Windows Phone 8 is the first Windows Phone release to be based on the NT kernel. The most recent version of Windows based on the NT kernel is Windows 10. Following the release of Windows 10, Microsoft has switched to a system of more frequent smaller updates to Windows. Windows allowed customization of its user interface since its first versions. Windows 1.0 and Windows 2.x allowed the user to change the color scheme in their Control Panel, however, there was no selection of pre-made color schemes and the user only had the option to reset to the default scheme. This changed with Windows 3.0 and its new Colors control panel, which allowed the user to choose from several included color schemes. 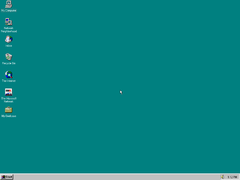 In Windows 95, the Classic theme was introduced. Later, in Windows 98, the Windows Desktop Update was introduced, allowing users to set a 2-color gradient for the titlebar. Windows XP saw the first visual style (i.e: Luna) come in to use, but users could still switch to Windows Classic if they so chose. In Windows Vista and Windows 7, the Aero theme was introduced, but the Basic theme was enabled by default on lower-end machines. This allowed users to have transparent titlebars. With Windows 8 and Windows 8.1, the Aero theme was revamped and the Aero Lite theme replaced the Basic theme for lower-end computers. In Windows 10, the Aero theme was revamped again, but the Aero Lite theme remained. Windows 10's November Update saw the option to enable colors on titlebars. Finally, with Windows 10 build 18282, the new Light theme was introduced. In 2004, incomplete copies of the source code of Windows NT 4.0 and Windows 2000 leaked to the Internet. These leaks were illegal, as the Windows source code is both a trade secret and copyrighted, and as so is protected by law. However, Microsoft has released parts of the source of the Windows Server 2003 kernel for research purposes. In 2017, The Register and other technology journals reported about a leak of the Windows 10 Shared Source Kits, which are available to qualified customers, enterprises, governments, and partners for debugging and reference purposes, to BetaArchive. Following the controversy, BetaArchive removed all source code content from its archives, which also included the aforementioned incomplete copies of the Windows source code, and adopted a policy of not accepting any more source code material. In 2018, the source code of the Windows NT 4.0 File Manager was released on GitHub under the open source MIT license. According to antitrust documents it was already in development before getting canceled in 2000-01. Initially supposed to be an interim release between Whistler and Blackcomb, the project objectives eventually included a lot of features originally intended for Blackcomb. Development was reset in 2004.